If one is limited to one word to describe Shifu’s work, it is “enigmatic”, for one is immediately struck by its powerful image, yet not knowing exactly what is doing the striking. They are akin to a new form of poetry, something unfathomable yet beautiful, affirmative yet illusive at the same time. But once we examine closely his work, we will realize that Shifu as an artist is uncompromisingly revolutionary and traditional. His artwork marries tradition with innovation, where the boundary of the moment is crossed into the creation of the immediate future. In common with most modern avant-gardist painters, Shifu’s art is non-representational. Perusing his works, we notice lines, or mostly the resultant formation from juxtapositions of primary colours: red, yellow and blue in acrylic paints; often times Chinese calligraphy in various scripts or even nebulous forms of black ink with varying degrees of tonality crawling over the surface of rice paper transposed onto canvas, almost always with red seals stamped on; other times, the collages of paper; and occasionally, another transparent layer of drip painting to finish it all. But when we step back, it’s obvious to see that Shifu’s work indeed pays homage to and echoes with major movements of modern art after impressionism, most notably: the Symbolist with Paul Gauguin, Expressionist mysticism of Wassily Kandinsky, Pure Abstraction of Piet Mondrian, Abstract Expressionism of Franz Kline, and the spontaneous Surrealism of Jackson Pollock. Looking at Shifu’s mysterious painting, one may think that a “method of madness” must be in place; but no, Shifu in fact borrows Gauguin’s general method of "synthesis", where color, composition, and subject matter are fused together so as to evoke the inner experience triggered by the outer events of life. 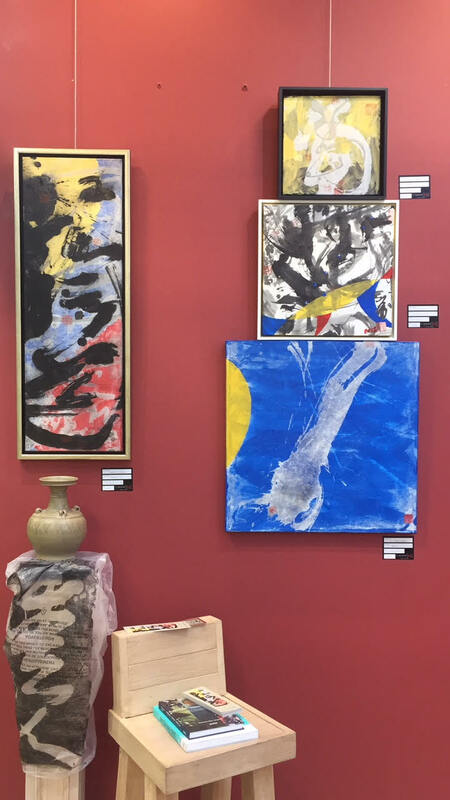 In the manner of Mondrian the purist, Shifu also uses the three primary colours for his palette because of their force of intensity and emotional expressiveness, coupled with symbolic meaning to signify the spiritual experience. 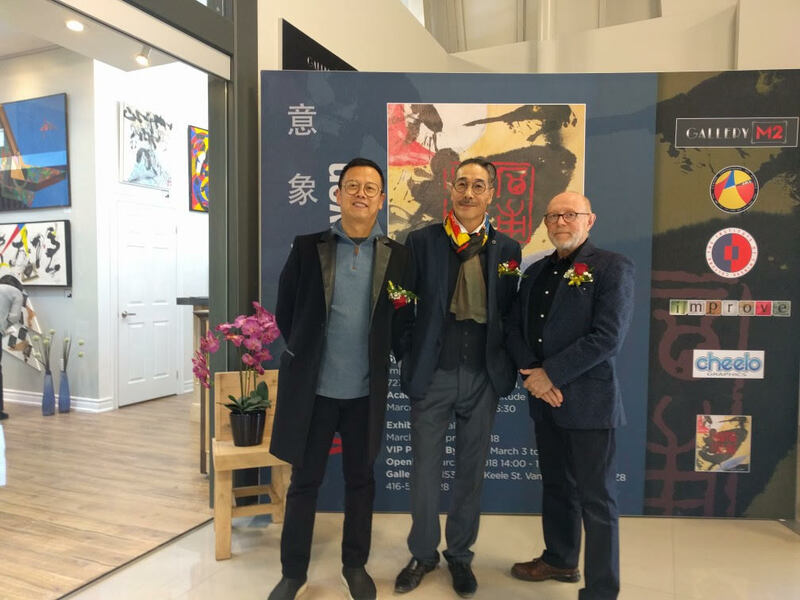 In Shifu’s work, not only do the primary colors connote purity and originality, they also help to add luminosity to the piece and to achieve the delicate balance for the overall composition. Shifu adopts the abstract approach as groundwork for his composition because, echoing with Kandinsky, he believes that abstraction without the classical perspective offers the possibility of profound, transcendental expression, which communicates a universal sense of spirituality. So, on par with Gauguin and the other Symbolists, Shifu also puts emphasis on the symbolic ideal that takes shape on a flat surface covered with colors in a particular order. As you may have noticed, his painting also involves Pollock’s “action painting” on some occasions to add richness, rhythm and reflective light to his complete work. Although Shifu doesn’t quite believe that his compositional inspirations arise from unconscious sources, as Pollock believed in his case, Shifu values greatly the spontaneous aspect of his painting experience, as we will see why soon. In sum, what Shifu takes away from the modern art movements is not just the method of abstraction, but the conviction that art making ought to go beyond the objective representation and offer a way of examining personal truth, as well as speaking volumes of the spiritual world that we all live through. Hence, he draws on personal experiences as the pure source of his art. Not surprising then, themes of his artwork rang from philosophical concerns, brooding upon human nature, gestual examination of the human condition, religious import, mundane existential angst, or simply the emotional outpour of inner life. Browsing over some of his painting titles suffices to make the point: for example, Vanity, Anchorite, Boobrie, Garden of Eden, Fountain of Life. One could already pulsate the soul that wants to be in touch with a higher power across the canvas. Through painting, Shifu strolls upon the landscape within. Like all great painters, Shifu possesses a prophetic vision. And to realize it, he needs to find a universal aesthetic language. Embracing many characteristics of modern art such as the usage of primary colors, flatness of forms, and dynamic balancing of tension may be viewed more like branches and leaves he grabs onto; whereas his full aesthetic language grows out of a root. Veritably, Shifu’s deeper root is embedded in his Chinese artistic tradition. What gives his work the the aura that is drastically different from any other modern painters is this thin but rich layer of rice paper covered with Chinese calligraphy-inspired ink art. 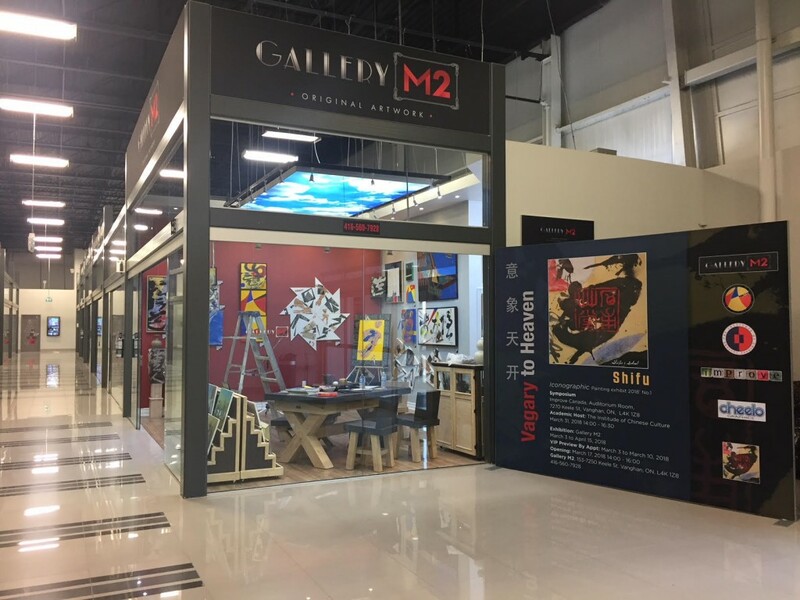 Shifu is a master of Chinese calligraphy who has immersed himself in it for over forty years; yet, what he mounts onto canvas is often the non-traditional “calligraphy” that has been deconstructed or even “disfigured” to suit the compositional need at hand. This is where Shifu’s painting gets remarkable: by taking full advantage of the fact that the ever nuanced tonality of ink can be achieved on rice paper, he creates these almost “multi-dimensional” images with the spontaneous but assured dab of his ink brush. Truly, the most important artistry that Shifu takes away from Chinese calligraphy is the prowess of delivering vital energy to the paper through the brush. It is this Bergsonian élan vital, or the corresponding Qi, 炁 in Chinese character that creates an aerial world on canvas, like the one through the looking glass of a fish-tank. Only with Qi, can works of ink art express vigor, spiritual import and poetic vibration. With Qi, everything becomes voluminous, every imagery conjured up within comes to alive. Every dot, every line, every turn from the ink brush expands into a world of the mind. And Shifu the artist, comme un poissson dans l’eau, like the fish in water, like a butcher handling his cleaver, paints like breathing itself. 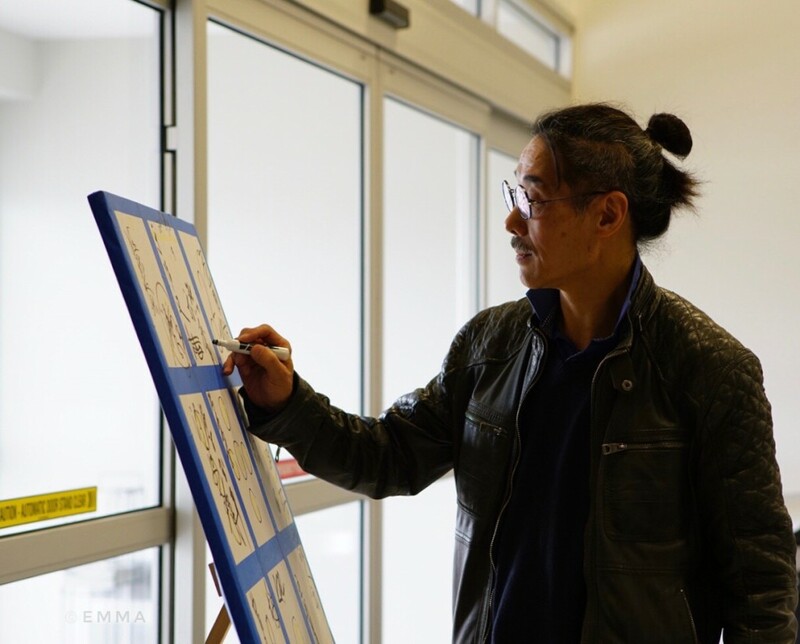 But the presence of Qi in calligraphy does not hold the whole secret to Shifu’s creative process, for he also possesses exceptional ability to create space without utilizing Western drawing perspective. Actually, Shifu is gifted with the miraculous skill of intuitively engraving Chinese characters that are invisible to the naked eye onto as narrow a surface as the diameter of a piece of human hair. All done with bare hand, without the aid of a magnifying glass! 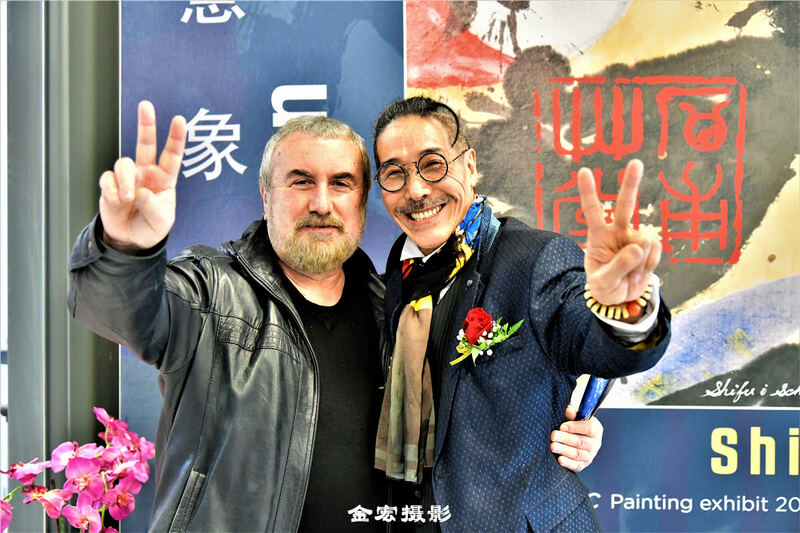 Beyond dexterity of the hand, it is this God-sent endowment of the mind that truly equips Shifu to approach painting via the elevated realm of the metaphysical, unveiling the mysterious and spiritual world that passed through his subjective idiosyncrasy. And that is not all, Shifu also utilize many other Eastern and Western sources for materials and ways to make up his rich and emergent aesthetic language, notably: the watery and wavelike moire pattern discovered on Majiayao pottery of ancient China, the art of traditional seal carving, stained-glass work, totem motifs, Peking opera masks, fragments from old calligraphy prints, newspaper clippings for collages… The possibilities are endless for him, and his sources of inspiration come from all forms of art and all aspects of life, all contributing to the balancing of Yin Yang, the harmonising act of sustaining creative tensions. Globally, Shifu’s work can be viewed as a hybrid construction using three primary colours and tones of black and white as the essential element, a construction where the calligraphy writing is transformed into all sorts of dots, lines, shapes and even volumes, layered together by mixed media of both Western and Eastern traditions. For Shifu, creating art is about carry on, build upon, but most importantly to reinvent traditions. That is the true spirit of being contemporary and original. In seeking the origins of originality, Shifu finds his own style of art. He names it “Iconography”, 意象画 Yìxiàng Huà. Perhaps one way to understand Shifu’s iconography is this: it unveils an overall image of the work of the mind, meditating on questions at hand through the creation of icons and their inner-workings. The trick to it, Shifu claims, is 得意忘形 Déyìwàngxín: to obtain the essence of an idea without caring for a preconceived form, i.e. laisse faire la forme. Yet, it’s indeed the visual aspect that makes Shifu’s iconography exciting and thought-provoking, with his poetic production of lines, expressive use of ink, semio-philosophical signs and religio-spiritual import of colour. Quite paradoxical, isn’t it? A great painting is usually realized at a time when an artist's technical command has come into harmony with his intellectual and spiritual maturity. Indeed, what sets Shifu’s iconography apart from other contemporary works is not only his innovational achievement of distinctive visual signature through technical ingenuity as well as modernist design, but also his philosophically inclined nature as an artist, where his iconography becomes a way to pose deep questions, questions about human nature, about spirituality and religiosity, about the human condition with its vicissitudes, as well as who we are as individuals. “Language is the house of being”, the German philosopher Heidegger has said repeatedly. For Shifu, iconography has finally become his visual language to transcended into the realm of the aesthetic, philosophical and the spiritual being. For him, art is a personal religion, the way to the Dao. Now, we as viewers, are we ready to follow it? 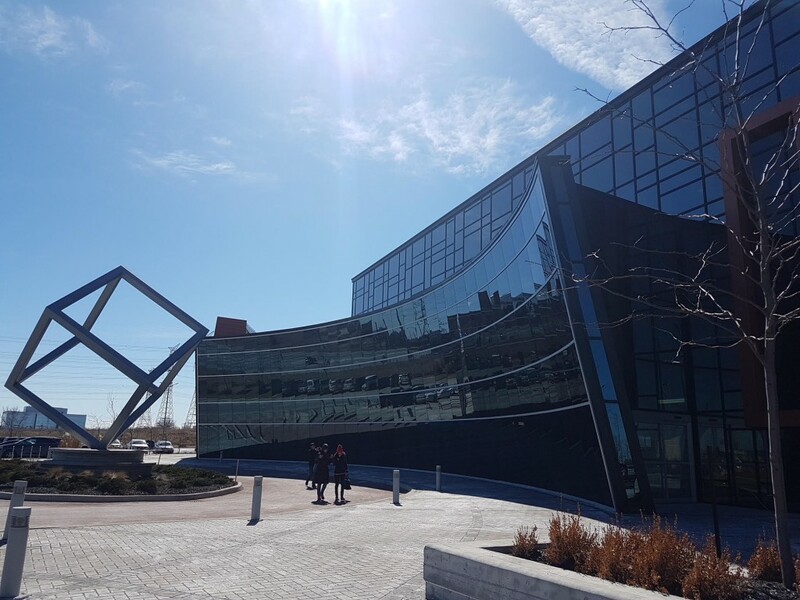 MISSISSAUGA – Remember the blackout in the summer of 2003? Iconographic artist Paulo Zen Shifu found the darkness that swept across North America's east coast on Aug. 14 to be quite illuminating. While driving on that day, Shifu recalled the sight of people helping direct traffic to be both "human" and "beautiful." Conversely, he remembers some taking advantage of situation when he entered a store to purchase water, milk and candles and found a huge markup on prices. That duality of human nature played nicely into a metaphor for a piece that he was to create a decade later. 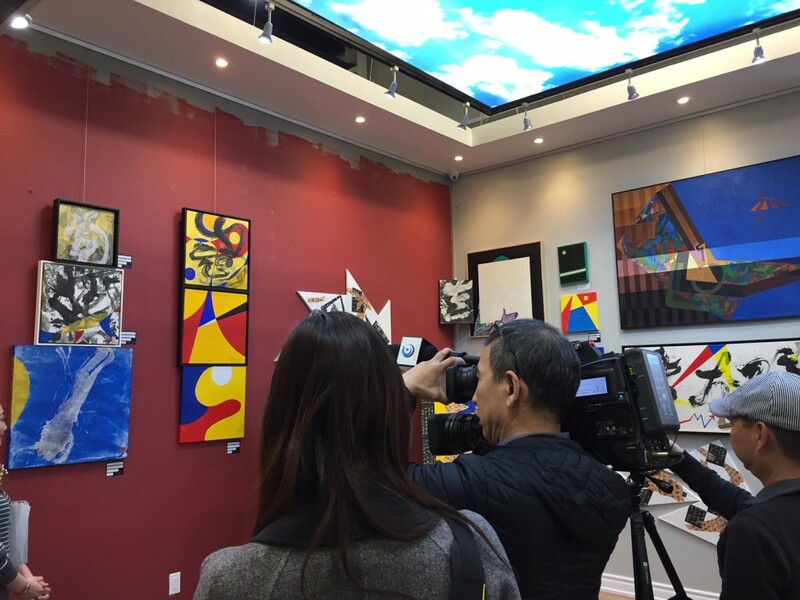 Entitled, Desire, the painting is one of Shifu's many creations on display until Jan. 18 at the Living Arts Centre gallery as part of the The Word of Art Exhibit. It's a celebration of Chinese culture through the ancient form of calligraphy. Using red clay and rice paper from the eastern tradition and mixing that with a more contemporary western approach of acrylic paint on canvas, Desire is a piece of cavernous depth that conveys the human struggle of light and dark. 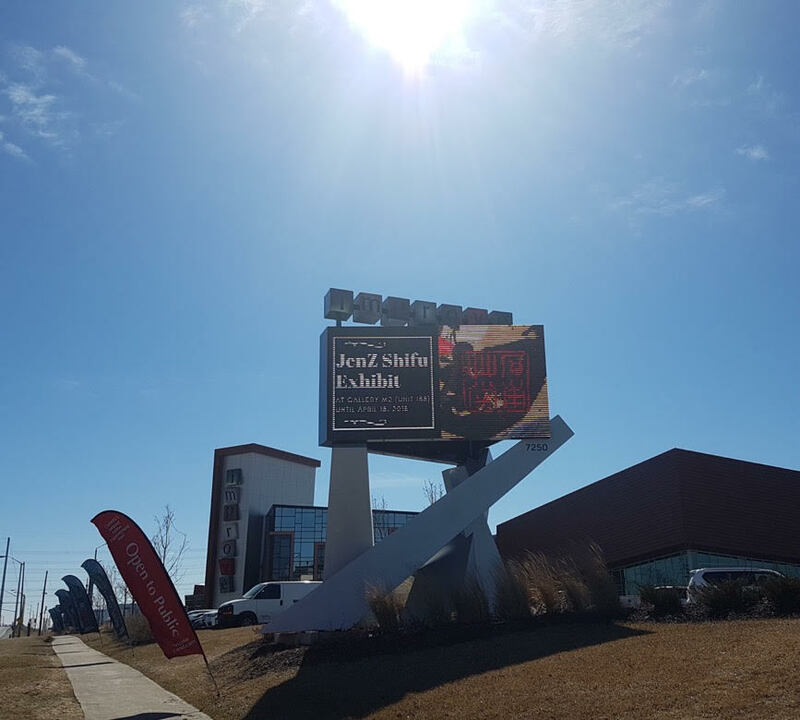 Incorporating an excerpt from The Mississauga News about the blackout, the piece delves into religious philosophies from both sides of the globe. Within the image, Shifu employs primary colours – red, blue and yellow – intended to be emblematic of the trinity in western teachings and the sweeping black brush strokes of what's known as the cursive school of Chinese calligraphy to convey a yin and yang concept from ancient Taoist teachings. 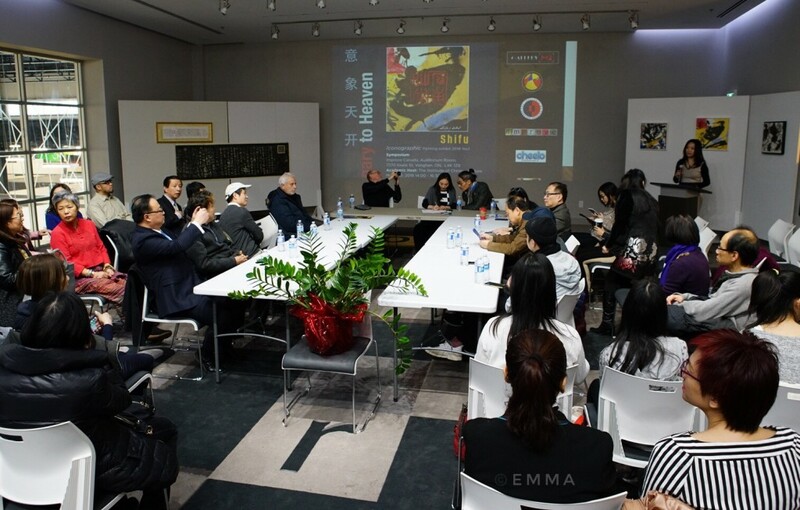 Tina Luo, Shifu's wife, explained that the pictographic characters central to Desire express a saying in China that in a dark situation "the good people, the kind people, always appear." 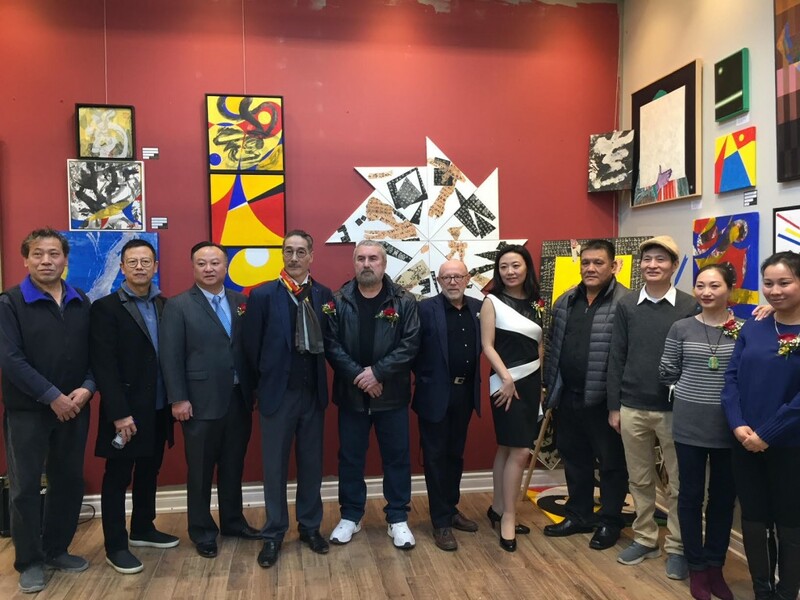 Another theme running through the pieces in the exhibit is a square, which Shifu said resembles a prison, with the Chinese pictographic symbol for human inside, an image reminiscent of a geometric compass. The motif is prominent in Shifu's more abstract installation, a sizeable 17-piece offering called Captivity vs. Freedom. Taking cues from ancient wisdom, he likens the square to the body because the body is like a jail. 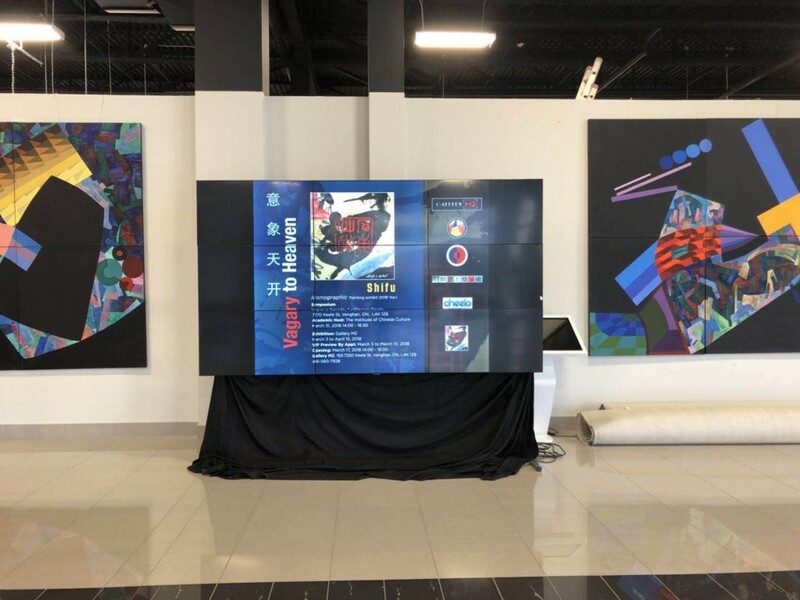 "People cannot control (their) body, but anyone can control (their) soul," said Shifu, adding that the exhibit aims to imbue viewers with a sense of self-reflection. 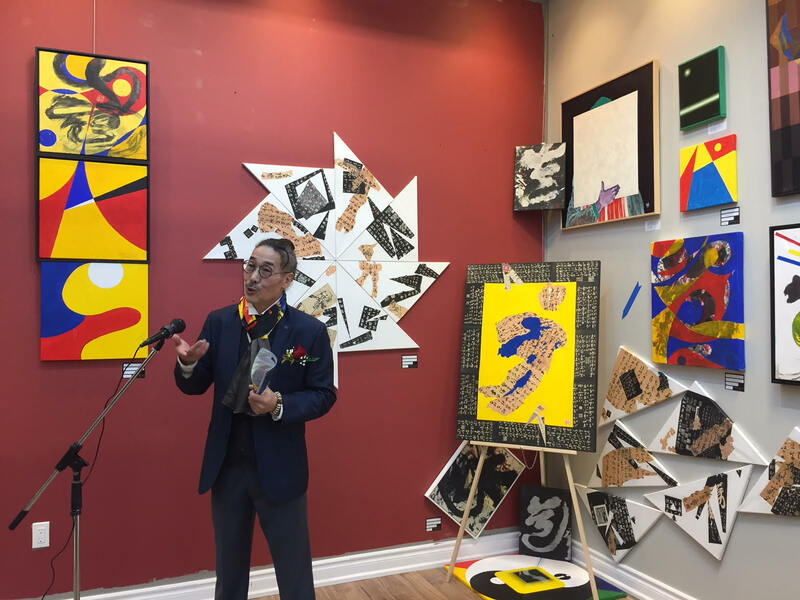 Having moved to Canada from China about two decades ago, Shifu said the The Word in Art is a combination of his life in both places. 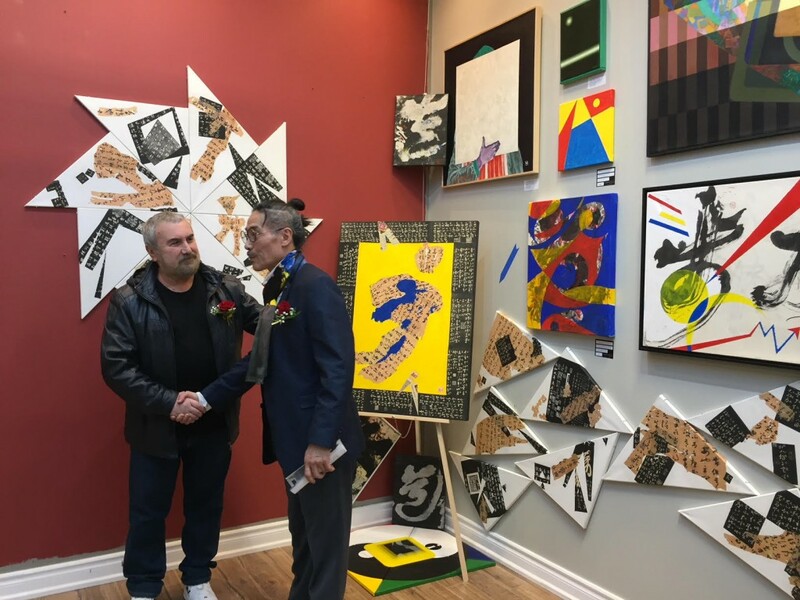 This juxtaposition is amplified by several traditional black and white pieces denoting Taoist scripture hanging alongside the colourful, more modern paintings. To view examples of his work, which has been on display from Vancouver to Dubai to New York to Hong Kong, visit shifuart.net. 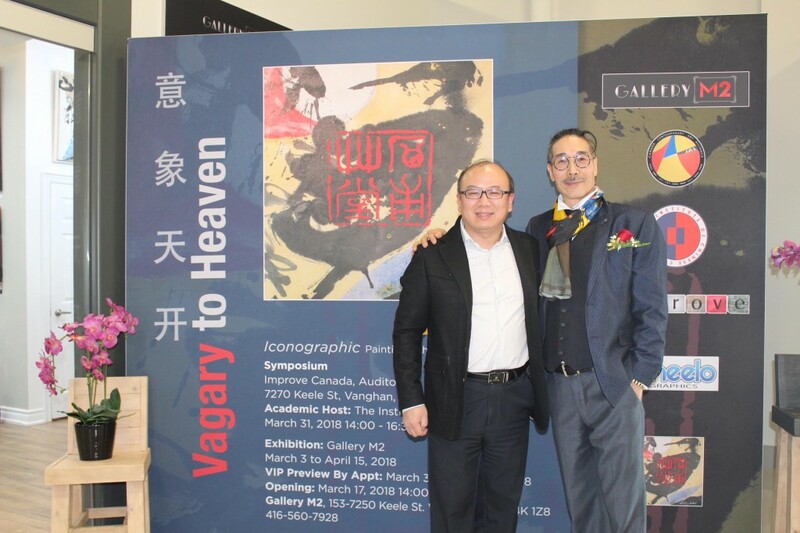 The LAC exhibition also features the work of calligraphy artists Chun Song Zheng, He Liang Chen, Zhen Yu Fu and Jie You. For gallery hours go to livingartscentre.ca and follow the links. Admission to The Word of Art is free. Confucius said "Set your heart upon the Way; support yourself by virtue; lean upon Goodness; seek distraction in the arts."